Jack Gerson discusses the lessons of the Occupy movement and it's future. On Monday December 12, the Occupy movement shut down the major west coast ports of Oakland, Portland, Longview (Washington), and Seattle. There were partial shutdowns or support actions at the ports of San Diego, Vancouver, and Long Beach, as well as in Hawaii and Japan. Wal-Mart distribution centers were blockaded in Denver, Salt Lake City, and Albuquerque. Other actions occurred in New York, Houston, Tacoma, and Anchorage. The Seattle, Long Beach, San Diego, and Houston protests were met with police violence. These coordinated actions showed that the Occupy movement is still very much alive, the various rants to the contrary by the bosses, the mass media, and assorted leftists notwithstanding. This is certainly true in Oakland, where I live. The nearly 10,000 protesters who shut down the port showed that Occupy Oakland’s November 2 Strike and Day of Action was no fluke. The December 12 actions rattled the entire Oakland establishment – corporate Oakland and the liberal politicians and labor bureaucrats who for years have carried their water while cultivating a “progressive” image. And the port shutdowns up and down the coast have delivered a strong message to the world maritime conglomerates: the Occupy movement will rally mass support to defend the longshoremen in Longview WA against a vicious union-busting attack from a multinational conglomerate. The Longview longshoremen, ILWU Local 21, are locked in a life-and-death struggle with the Export Grain Terminal corporation (EGT). EGT is a joint venture between three conglomerates: U.S.-based Bunge North America, Japan-based Tochu Corporation, and South Korean-based STX Pan Ocean. EGT just spent $200 million to construct a highly automated grain elevator at the Port of Longview. Although EGT signed a lease agreement with the Port promising that all cargo work would be done with ILWU labor, it won’t honor that agreement. EGT tried to hire non-union labor and, when that failed, contracted with another union, Operating Engineers Local 701, that is willing to raid ILWU 21 and to cross their picket lines. EGT is using tactics straight out of the coal field labor wars of the 1920s. They hired private “security” (Pinkerton-like goons). They’ve enlisted the local cops to stalk, harass, and assault ILWU members – tailing them around town and even dragging them out of their homes in the middle of the night. Local 21 has fought back. In the course of the battle in Longview, ILWU members and their supporters have blocked trains from bringing grain to the terminal and organized mass pickets to disrupt its operations. 220 of the local’s 226 members have been arrested. Both the Washington and Oregon state labor federations have passed resolutions supporting the Longview ILWU and condemning the Operating Engineers for raiding and for crossing ILWU 21′s picket lines. This ought to be a central priority for the AFL-CIO, because if EGT succeeds in locking out ILWU 21, it will set a precedent for union-busting up and down the coast. The AFL-CIO ought to provide material support to ILWU 21. It ought to tell the Operating Engineers to either end their raid or face censure and expulsion. And it ought to build towards a general strike against the union-busting. But none of this will happen. AFL-CIO president Rich Trumka won’t take sides and he won’t act. Trumka calls it a “jurisdictional dispute”. Indeed, the AFL-CIO leadership – and not just the top leaders, but most local officials and staffers as well – have for decades bought into the “team concept” of collaboration with management. Fundamentally, they believe that there is no alternative to capitalism. Thus, when the system is in crisis, they try to coerce workers to passively accept austerity (cuts to jobs, compensation, pensions and social security, and public services). So instead of leading mass organizing drives, they raid each other’s unions as union membership dwindles to barely one in ten workers. A confrontation is imminent. EGT plans to bring in its first ship in mid-January. So with Trumka and the AFL-CIO sitting on their hands, what can be done? Here is where the Occupy movement can play a role. On December 17, Occupy Longview, which has close ties to ILWU 21, called for a mass convergence on Longview in January to block the loading of the EGT ship. On December 21, Occupy Oakland voted overwhelmingly (123 – 2) to respond to Occupy Longview’s call by organizing a caravan to Longview. Occupy organizers are projecting well over 10,000 – perhaps as many as 25,000 – occupiers descending on Longview from around the West. And unlike ILWU International President McEllrath (who opposed the December 12 port shutdown by an “outside group trying to advance a broader agenda”), ILWU Local 21 President Dan Coffman welcomes support from the Occupy movement. This from Coffman: “On behalf of Local 21, we want to thank the Occupy movement for shedding light on the practices of EGT and for the inspiration of our members”. In addition to the convergence on Longview, Occupy can support and help propagate the call from ILWU rank and file militants who are urging the International to strike the entire West Coast when the EGT ship arrives – and, if McEllrath won’t issue the call, then the locals and the rank and file need to organize a coast-wide wildcat. Let’s recall that in significant – although admittedly infrequent – cases, ILWU locals (and, in still rarer instances, the entire West Coast ILWU) have acted in defiance of the contract and the law to shut down the ports, even without the spur of community (“outside”) picketers. (To name such instances: the 11-day boycott of South African cargo famously saluted by Nelson Mandela; a one-shift West Coast shutdown to support Mumia; a one-day strike against the war; a shutdown in Los Angeles in solidarity with Australian longshoremen; and a Puget Sound ferry strike in defiance of injunctions.) Shutting down the big ports of Oakland, Portland, and Seattle got the attention of the world maritime industry. Shutting down the twin megaport of Long Beach / Los Angeles would deliver a heavy blow: Long Beach / Los Angeles handles 40% of this country’s shipping, nearly ten times as much as the Port of Oakland. So we believe that the ILWU can win this immediate battle. But it will take far more to win the long-term war. First of all, it will take identifying the true nature of that war. Today longshore is highly automated and longshoremen are the highest paid but one of the numerically smallest group of workers at the port. Meanwhile, the most numerous workers at the port – the port truckers – are by far the lowest paid, the most exploited, and are completely unorganized (forced to work as independent contractors). There cannot be a long-term victory for labor on the longshore without organizing the unorganized port truckers. But more than forty years ago, the ILWU agreed to deals around containerization / automation that guaranteed high pay, benefits, and job security in exchange for allowing gross attrition of jobs as workers retired. The ILWU has been far too content to rely on this arrangement, rather than reaching out aggressively to support and help organize the port truckers. So although Longview Local 21 is fighting militantly against EGT and is reaching out to Occupy for support, the ILWU International shows zero interest in organizing or otherwise fighting for the truckers. Such organizing remains essential. We ought not to look to the ILWU International to do it. The people who are planning to stay at the port—do they have families who have trucks that because of the shutdown in the economy may lose those trucks? A day’s pay – $600, $700—could be the difference as to whether they can keep that truck or not. Quan is disingenuous: most truckers clear less than $100 / day for a long day’s haul – often as little as $50. But she is poking at a weakness, and it’s one that we can ill afford to ignore. Let’s be clear. Occupy has not ignored the port workers. Indeed, port truckers in Los Angeles’s Latino community were the first to call for a December 12 port action, when they voted to withhold their labor on this day, which is a cultural holiday in the Latino community. In solidarity with them, Occupy LA voted to blockade ports servicing the SSA shipping company, partly owned by Goldman Sachs. 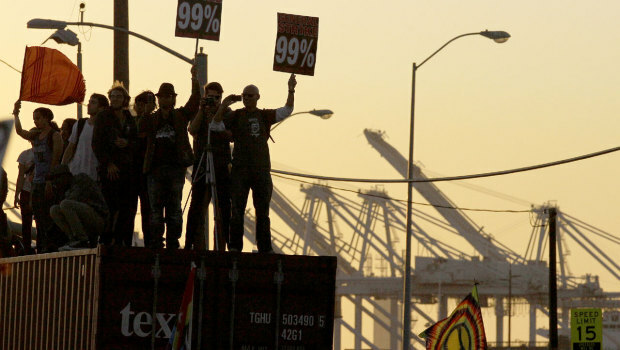 Occupy Oakland then joined their call and broadened it, calling for a west coast port shutdown in solidarity with the truckers and with the locked-out longshoremen of ILWU Local 21 in Longview, and to disrupt the profit chain of Goldman Sachs and “Wall Street on the Water”. In the event, the LA port truckers were unable to repeat their successful wildcat of May 1, 2006, when they effectively organized a significant number of the more than 15,000 southern California port truckers to shut down LA / Long Beach longshore operations. Nevertheless, the successful port shutdowns in Oakland and the Washington and Oregon ports have fully focused attention on the desperate struggle in Longview. But organized labor has ignored the port workers. And the Occupy movement itself has steered clear of direct labor organizing. It does not educate about the need to organize the unorganized, and Occupy leaders have discouraged efforts to educate internally and organize externally around a set of concrete demands that could speak to the needs of the unorganized and ensure that organized jobs are decent jobs. This leaves such organizing at the mercy of the labor bureaucracy. Can Occupy sustain and deepen a mass movement on this basis? Without at least discussing this question and developing strategy, the Occupy movement is bound to act as a large “solidarity” movement: engaging in episodic disruptive mass actions followed by weeks of lull where organizing slows to a crawl while waiting for new struggles to support and/or new occasions for disruptive direct action; supporting others’ struggles and demands from the outside. This leaves Occupy vulnerable to the nature of those struggles and the content of those demands. To be clear: I am not proposing that the Occupy movement as a whole adopt a set of detailed demands and set out to organize the unorganized. (I think that Occupy derives much strength by remaining essentially a broad united front under the general umbrella sentiment of economic justice and anti-capitalism.) But I do believe that groupings inside of the Occupy movement should do so – and that this should be a priority for Occupy labor outreach groups. The Occupy movement – and especially Occupy Oakland – has demonstrated remarkable resilience and an almost unprecedented ability to repeatedly mobilize mass actions against economic injustice and police brutality. Many of us have underestimated this movement. Leftist blogs are filled with statements like “Occupy Oakland is dead” and warnings that Occupy is capitulating to the liberals, capitulating to the Democrats, capitulating to the labor bureaucracy — and that unless this or that formula is followed failure is certain. If we are to be taken seriously by this movement – and, perhaps more to the point, if we are to understand it and help it to move forward – we need to first acknowledge that the movement hasn’t corresponded to the preconceived notions of veteran socialists. Moreover, it has far exceeded our expectations. And, despite problems, it continues to act independently of the Democrats and the bureaucrats. Indeed, its deep-seated, if inchoate, anti-capitalist message and its remarkable ability to mobilize mass disruptive protests have left the Oakland establishment dazed and disoriented. But their campaign failed, and its failure took them by surprise. The cops had estimated that at most 300 protesters would try to shut down the port. But more than 1,000 picketers showed up at the Port of Oakland to shut down the morning shift, and nearly 10,000 shut down the afternoon shift. Now, Occupy Oakland has organized the largest mass militant demonstrations in at least forty years, targeting corporate Oakland and suspending business as usual. And it has done it on multiple occasions. This has dragged into the open the true role of the ex-radical politicians who run Oakland city government and their long-time friends and allies in the local union bureaucracy. All of these “progressives” operate on the assumption that Oakland’s well-being depends upon the well-being of Oakland business – especially the port, the developers, and the banks. So to them, anything that gets in the way of business hurts the people of Oakland. Thus, Quan argues that shutting down the port is “economic violence” that “holds the city hostage”, and City Council members echo the same refrain. Of course, in the context of the current, deepening global economic crisis, there will be no end to corporate demands for cuts, layoffs, and handouts from the city. The Occupy movement has challenged this assumption, and the politicians are ducking for cover. Their election has been based on their “left” image, but for years they have been pawns of the corporate bosses. Occupy is forcing them to choose: which side are you on? The labor bureaucrats, who have for decades embraced the “team concept” of collaboration with management, are caught in the same bind. Consequently, cracks are developing in the “progressive” cabal, as long-time Quan allies hedge their bets. Thus, Quan’s long-time comrade Dan Siegel resigned as her legal adviser to distance himself from her authorization of cop violence in October. Oakland Education Association President Betty Olson-Jones, another ally and personal friend, supported the port shutdown (OEA was the only union to support the December 12 action). The local labor council condemned Quan’s authorization of cop violence against Occupy and declared that she is “on the wrong side of history”. Sharon Cornu, a mover and shaker in the local Democratic Party and the former head of the local labor council, resigned as Deputy Mayor. To be sure, they continue to hedge their bets: thus, within days of the port shutdown Olson-Jones was a featured speaker at a mass meeting organized to try to salvage Quan’s career; a few days later the local labor council leadership held a press conference to urge workers to “give the Mayor a chance” so that “she can bring jobs to Oakland”; Cornu continues to praise Quan’s handling of Occupy Oakland. So Occupy has not capitulated to the liberal politicians. But neither does it pose a political alternative to this leadership. Occupy remains a powerful force, but its power lies exclusively in its ability to mobilize massive but episodic direct actions. It consciously eschews political action. Left unchanged, this will cede political leadership to one set or another of representatives of the bosses. Whether or not the Occupy movement as a whole adopts a specific course of political action, it is important that the movement at least understands the importance of combining mass political action with mass direct action, and creates space and opportunity for its participants to pursue this. Just as Occupy has not capitulated to the liberal politicians, neither has it capitulated to the labor bureaucracy. It is, however, a fact that much of Occupy Oakland’s labor outreach committee consists of the old “labor left”, including several who have made a career of carrying water for and currying favor with the local labor bureaucrats and the “progressive” politicians. This is one of the factors that have caused many, myself included, to conclude, mistakenly, that the “progressives” had taken charge – or, at a minimum, that capitulation to them was well under way. To be sure, there are problems here – most importantly, perhaps, has been the tendency to overly orient to the labor bureaucrats. This came out most sharply when the Occupy Oakland leaders insisted on treating the local bureaucrats as equal partners in organizing an “Occupy / Labor” rally and march on November 19. They used the terms “labor”, “organized labor”, and “labor leadership” synonymously, and did not seem aware that except in rare instances the bureaucrats can’t or won’t mobilize their members. Thus, although a few thousand marched on November 19 – and although several labor officials spoke at the rally, it was not a “labor march” at all – there were only two or three labor contingents on the march, each of fewer than 10 people. This helped local labor officials strengthen the image they present to their rank and file, without mobilizing the rank and file and without in any way changing their long-term collaboration with management. Nevertheless, Occupy has not capitulated to the labor bureaucracy. If one does not appreciate this, one cannot really understand the December 12 port shutdowns, when only one union (OEA) supported the action and the full power of corporate Oakland and much of the labor bureaucracy was arrayed against Occupy. Instead, the direction of Occupy Oakland’s labor work continues to be largely determined by the “insurrectionist anarchist” core that has been the power behind the scenes for all of Occupy Oakland since its inception in early October. That direction remains to organize mass disruptive direct action protests, and there is little evidence that they have altered their approach to accommodate labor officials or politicians. The insurrectionists are not about to capitulate to the progressives – at least not in the near future. But while there has not been a capitulation to the labor bureaucracy, much of Occupy’s labor orientation has been to attempt to engage unions through the union leadership. The interests and actions of workers are not synonymous with the elected leadership of their unions, particularly at the International level. The Internationals, and many locals, are integrated into the Democratic Party machine and act as agents for labor-management collaboration, government ideology and policy in administering concessions and opposing militant action. Thus, as we discussed earlier, the labor movement cannot move forward without an aggressive campaign to organize the unorganized and to provide jobs with adequate pay and decent working conditions. This simply will not happen at the initiative of the labor bureaucracy – indeed, they will squash it and / or try to channel it into a campaign to organize some of the unorganized into rotten sweetheart contracts. It is very important to be clear about this, because without such clarity Occupy will inevitably “leave to Caesar what is Caesar’s” – i.e., to treat the elected labor leadership as though it represents the interests of the organized workers, rather than those of the Democrats, the state, and – at bottom – the bosses. Jack Gerson was a former leader of the RSL and still has residue from that for approaching class struggle from a Trotskyist perspective. But he's an honest trade union activist who recently retired, but who keeps his union membership status active by substitute teaching. He regularly joins other rank-and-filers to carry the Oakland Education Association banner at marches and rallies, with the rather unpoetic official union slogan: BAILOUT SCHOOLS AND SERVICES NOT BANKS! STOP FORECLOSURES!" He served on the OEA executive board, bargaining team, and was regularly quoted in the press as a union spokesperson. Although he's critical of the present union president, Betty Olson-Jones, he and his caucus campaigned for her slate. And Gerson brings some of that Old/New Left orthodoxy by resisting the lack of demands of the Occupy Movement. His proposal, which is fortunately unsuccessful, is for demands like "JOBS FOR ALL!." And again, he brings the Old Left to mind with slogans like "Organize the unorganized." Which begs the question: does he mean into the AFL-CIO or Change to Win? If Gerson's position is "close to... but not identical" with Insurgent Notes, that means that neither are very far from their common roots in the International Socialists (the Shachtmanites around Hal Draper). I think Gerson is correct in his assessment: Neither the Democratic Party apparatus nor union officialdom has captured Occupy Oakland, and for the reason Gerson gives, namely, the insurrectionary anarchists have more or less established political hegemony in the various committees and groups that are most deeply involved in Occupy Oakland. At the same time, I think there is an element of substitutionalism in these activities, at least in relation to the port workers; or, to utilize Gerson's rather solicitous phrase, Occupy Oakland runs the danger of acting only as a solidarity movement. Here, I think it is important to be specific: I said “an element of substitutionalism” because I do not think it is cut and dried question of activism versus agency. Permit me to explain. Far more important it is the experience of youthful casualization, emphasis on casualization, that is at issue here. Casualization is a worldwide phenomenon, and we need only to cite a few figures and instantiate specific situations to grasp how pervasive it is: A full 40% of the workforce in Japan and 60% in Korea are casualized, and by my own rough estimate based on Bureau of Labor Statistics there are 82,000,000 casualized workers in the United States (an estimate made some months prior to that moment from which we mark the onset of an open crisis of capital, the collapse of Lehman's in September 2008); or, as a specific example, since the same moment the savage and crushing casualization that has been imposed in Greece where youth unemployment is 40%; or for that matter, in Bosnia and Herzegovina were it is 58%, Macedonia were it is 52.5% and Serbia where it is in excess of 49%. Similar situations obtain across the Maghreb and in Egypt, as well as in coastal China to mention just two further regions where various forms of proletarian resistance to capitalist responses to the crisis have forcibly emerged. I pointedly mention unemployment in the same sequence as casualization because the two are directly related phenomena. What connects them is not merely the obvious precarity, but the entire historical development from which they sprang... the history of workers defeats in the last two decades of the twentieth century, and the class recomposition created by vastly accelerated technological innovation that employers were able to impose following those defeats... and on this basis their contrast with nature of work in the high era of the big factory (Fordism), i.e., the contrast with full-time, far better if not always high waged, benefited work. Where or not it is a thematic concern, it is the novel situation the collapse of the big factory created that is the point of departure for insurrectionary anarchists: They, and the largely youthful anti-authoritarian milieu as a whole from which they have risen, have no personal connection to the labor movements across the capitalist world (such that they are), more importantly they and that milieu have no personal experience of the history of defeats organized labor has undergone, they and that milieu have few expectations of ever exacting any benefits constituting the social wage (e.g., in the United States, Social Security, Medicare, etc. ), and, to boot, they and that milieu confront with various degrees of understanding a Earth as the foundations of human existence subject to relentless plundered by capital and the crisis most associated with it, climate change. While to be sure there are any number of young people involved in the Occupy movement who are not fully proletarianized (say, reproducing themselves socially with the assistance of parents), the insurrectionary anarchists are, with respects to this situation in its entirety, the politically conscious layer of by far and away the most massive largest working class stratum in the world today, the casualized and, as part of it, its largest layer, casualized youth. In this specific sense, to the extent the Occupy movement is taking its lead from the insurrectionary anarchists its actions are not simply substitutionalist; rather, between two very different layers of a global working class with qualitatively different social and historical experiences, it is a question of elaborating a common project. But in Oakland its elaboration is flawed. There are two points here. First, in Oakland the insurrectionary anarchists have themselves become bureaucratized. Committees memberships are fixed (i.e., they admit of no new members), decisions are made in closed meetings, and the decisions are non-revocable. Second, Jack Gerson has tacitly suggested a direction in this regard, one I do not accept, that merely yokes the energies of Occupy to a reinvigoration of the labor movement... I shall return to this, momentarily. The second broad issue I shall address concerns unions. Gerson thinks the crucial issue for the ports is the truckers, or organizing them. He's right about the truckers. In fact, after the 2014 ILWU-PMA contract is negotiated, they may be ever more crucial since without a winning fight at and around Longview longshoremen's numbers may become so marginal due to contractually accepted attrition and full-scale automation of the docks that they will go the way of nineteenth century steamboat engine mechanic. While Gerson's perspective is that of an honest trade union militant, his prescription for organizing them belongs to another time, specifically to the Fordist era of the big factory. He thinks Occupy is leaving organization to the union bureaucracy (in which case, he appears to suggest it will not get done), but he chastises Occupy “leaders” for discouraging educative efforts “internally” and for not putting forth a “set of concrete demands” that would articulate the needs of the “unorganized,” providing them with “organized,” “decent jobs.” Gerson, in other words, sees the central problem in terms of vastly expanding the existing labor movement, presumably overturning the labor bureaucracy in the process. I suspect Gerson further sees all this in terms of a mass upsurge on the model of the CIO campaigns of the thirties of the last century. But he'll have to speak for himself here (or, since his perspective is close to Insurgent Notes, perhaps Loren could ask him). Similarly, he thinks that in Longview the rank and file in the ILWU will have to do for themselves what labor officials refuse to do. Maybe, but not likely. Organizing the unorganized, and building rank and file movements in the unions, are perspectives that belong to an era on which the crisis has once and all finally foreclosed on. And while I think unions remain the first line of defense for organized workers, and that we are obligated to defend unionized workers in struggles against employers and against their state in whatever manner we can, the reason that Gerson's perspectives are no longer adequate to our situation today is the crisis of capital has foreclosed on unions as such. Gerson does not understand this situation in this manner, and he certainly does not grasp the centrality of casualization to this situation. Thus, he thinks of the truckers as disguised proletarians, as independent contractors that are being crushed under the weight of debt (truck payments), maintenance and high fuel costs (a perspective with dovetails with that of the more regressive elements in Occupy who see the world in terms of the 99% in a struggle against greed and the banks and who pursue efforts to leap over the historical present, backwards, to return to an era which is now part of the past). In point of fact, this is a situation that obtains neither in Oakland nor the LA-Long Beach port. About one in twelve truckers in Oakland are waged and the Sikhs, blacks and Spanish speakers who form a large majority of truckers there do not “own” their trucks in the first place but lease them through a broker and are payed a piece rate. Nor do most them get anything like regular, full-time work, hours vary some weeks more than forty others much less. A similar situation characterizes troqueros at LA-Long Beach. All these people are casualized proletarians, and there status as such is fairly obvious... It is highly dubious that the unions can address their situation... I won't elaborate on the ethnic-racial tensions that overlay the differences between the Anglo independent contractors so-called and the nonAnglo truckers in the port in Oakland... and, I would also note the troqueros have already shown a well-developed capacity for self organization. At any rate, the approach to these workers as casualized will and cannot be made along the lines that built the CIO. But this besides the point. The upsurges that we confront now and into the future will not have the features that characterized the mass production industries during nineteen thirties. Under today's conditions, the objectives of big factory organizing have also become obsolete. Perhaps the only effective aim of organizing under conditions of extensive casualization of the proletariat entails activity that seeks to achieve provisional agreements not bound by legal contracts, instead of institutionalized collective bargaining, a legalized contract extended over a set duration of time; enforcement of the agreements by irregular (frequency undetermined) or quickie strikes that relies solely on the initiative and self-activity of workers themselves, on their participation and direct confrontation, different in nature from and counterposed to the lengthy, potentially demoralizing strikes of attrition that are infrequently waged by unions. And all of this is aimed at more or less negotiating the terms of non-work, of a time distinct from work as a mediated expression of an intense desire to suppress it altogether. But these too are merely subordinate considerations because the overriding aim here is to insure that the bond between casualized workers and employers, tenuous among large layers of the casualized, never develops; that, in those upsurges as they more and more openly counterpose capital to workers, the visceral orientation of workers will be altogether to the overthrow of capital on the basis of our organizations as we create them in the context of a revolutionary situation which this activity itself defines.